While some people simply want to live their life focusing on themselves and their loved ones, others have a deep desire to fulfill some greater purpose in life. 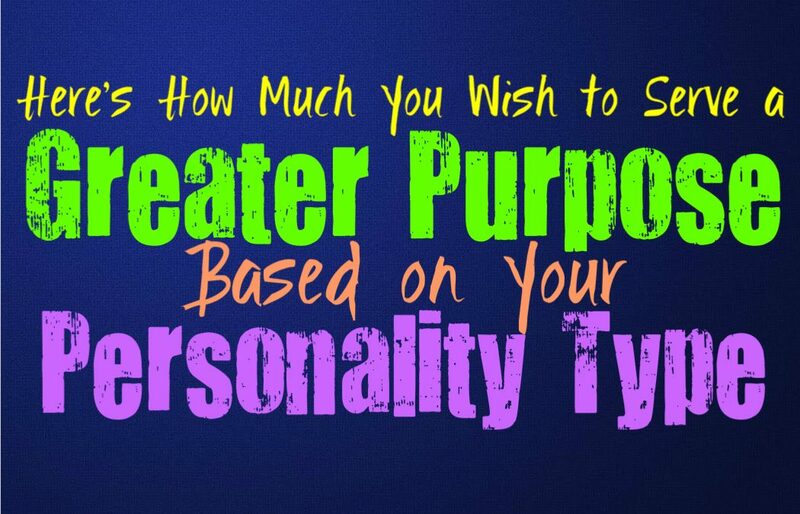 Here is how much you want to serve a greater purpose in life, based on your personality type. From a young age most INFJs have this feeling deep inside of them that they are meant to fulfill some greater purpose. Part of this comes from their compassionate and intuitive nature, and their ability to sense the worlds need for help. They are aware that someone who is empathetic and in touch with others, needs to use that ability to make a difference and facilitate positive change. While INFJs feel deeply that they are meant to serve a great purpose, they can struggle throughout the years to figure out exactly what that purpose should be. ENFJs do often feel this deep need to serve some great purpose in life, which is why they always strive to make a difference. While ENFJs might not be sure what that purpose is, they do work to make a difference and help others wherever they can. The ENFJ usually spends most of their time and energy helping others and trying to make their loved ones happy. For them even making a difference in the people’s lives they encounter, means they are working towards that greater purpose that they mean to achieve. INFPs do often feel this inner need to serve a greater purpose in life, but they often struggle to figure out what this might be. They often feel like they have so much potential inside of them, and a strong desire to make a difference in the world. While INFPs often feel this drawing to make a difference, they have a hard time motivating themselves to seek this out. They simply are unsure what steps to take, and sometimes the internal pressure can be rather intense for them. ENFPs do often feel as if they are capable of some sort of greatness, and enjoy the idea of making a difference in the world. ENFPs want to be able to achieve something meaningful with their lives, always hoping to find the right purpose to really make a difference. They might not appear outwardly like they possess this inner desire to serve a greater purpose, but in truth this is something that lives inside of them. They simply struggle to find what this true purpose might be, also becoming easily distracted and bored of anything that doesn’t spark their passions. INTJs are very driven people and a part of them does desire to serve some sort of greater purpose in life. Their main goal is often to remove ignorance wherever they can, from themselves and from the people around them. This desire to try to remove ignorance and educate people is definitely a greater purpose that the INTJ wants to fulfill. They also want to find a way to achieve this on a larger scale, hoping to put something into the world that helps to actually affect how others see things. ENTJs are very focused people who seek to accomplish all of their goals. They don’t allow anything to stand in their way and will strive to always improve. ENTJs often desire to achieve greatness in life, hoping to accomplish something that withstands the test of time. They do desire to make a difference, mostly they want to provide something that educates and impresses others in the world. ENTJs do believe that they are meant to do something truly great with their lives, and so they work to achieve this. INTPs often struggle with this internal feeling that they are meant for some sort of greatness. They are often told most of their lives that they have immense potential, and this definitely puts a lot of pressure on them to live up to it. INTPs are intellectual people who possess so much inside of their rich inner minds, and are capable of coming to conclusions that many people could never achieve. Their abilities make them capable of achieving a greater purpose in life, they simply struggle with the motivation and sometimes the clear idea of what they are meant to achieve. ENTPs do want to make a difference in the world, and might feel that they are meant for greatness. They desire to help others learn and grow, and sometimes this means pushing them. ENTPs can push boundaries that might leave some people feeling uneasy, but they desire to see others step outside of their comfort zones. ENTPs realize that in order to really grow and improve sometimes this means feeling uncomfortable, and so they seek to help others achieve this. ISTJs don’t usually feel a deep desire to serve some great purpose, but they do want to help others. They strive to do their best in their career, wanting to accomplish their goals. They often have a strong sense of duty and believe in doing their best to be someone others can be proud of. ISTJs might not believe they need to serve some great purpose, but they do have a strong sense of direction and purpose in their lives. They want to provide for their loved ones and be an upstanding citizen and community member. ESTJs do believe in making a difference and doing their best in life, but they don’t have a strong desire to serve a greater purpose. ESTJs simply want to work hard to accomplish their own goals and be capable of providing for their loved ones. They do want to achieve some sort of greatness, but only in a way that makes themselves and their loved ones proud. They don’t really feel a need to serve some greater purpose, instead they are happy just going after their goals and working hard. ISFJs don’t often feel some need to fulfill a greater purpose, instead they happy living simple lives. They do have deeply caring hearts and strive to make a difference for the people they love. ISFJs work hard to provide for and please their loved ones, always wanting to make them happy. They strive to create a sense of harmony in their environment so that the people around them are at ease. While ISFJs don’t always have a desire to serve a greater purpose, they do desire to help others in any way they can. ESFJs do want to make a difference and help others, but rarely do they feel this need to serve a greater purpose. For them the best thing is to provide for their loved ones and work hard to make them happy. ESFJs are caring people who do want to help others and ease their suffering, and often strive to do what they can in order to take care of people. While they are deeply caring and giving people, they rarely feel a desire to serve some greater purpose, instead they just want to help who they can. ISTPs are very independent people who like to keep their thoughts and feelings to themselves most of the time. While they do want to accomplish things that are meaningful in life, they rarely desire to serve some greater purpose. They live their lives in the present moment, seeking out information and striving to understand as much as they can. While they do have their own goals and desires, the ISTP doesn’t usually seek to serve a great purpose. ESTPs don’t usually have a desire to serve some greater life changing purpose, instead they just want to live their own lives. They might work hard to accomplish their goals as they get older, striving to climb their corporate ladder. ESTPs want to make a comfortable life for themselves and their loved ones, and enjoy being someone others can be proud of. ESTPs don’t often feel a strong desire to fulfill a greater purpose or to change the world, but that doesn’t mean they aren’t capable of it. ISFPs are deeply caring and sensitive people, who do feel a desire to make a difference in the world. While they want to do what they can to help create a sense of change, this doesn’t always lead them to serving some greater life purpose. ISFPs are perfectly happy just making a difference in small ways, following wherever their heart may lead them. They often live in the present moment, doing what they can to make a difference when it arises. ESFPs don’t usually fee some deep need to fulfill a greater purpose, instead they just want to live their own lives. While ESFPs do want to take care of others and enjoy making people smile, they don’t have these lofty goals to change the world most of the time. They might end up travelling a path that leads them to serving a greater purpose, but that doesn’t mean they actively seek this out. ESFPs live in the present moment, simply going after what feels right to them.